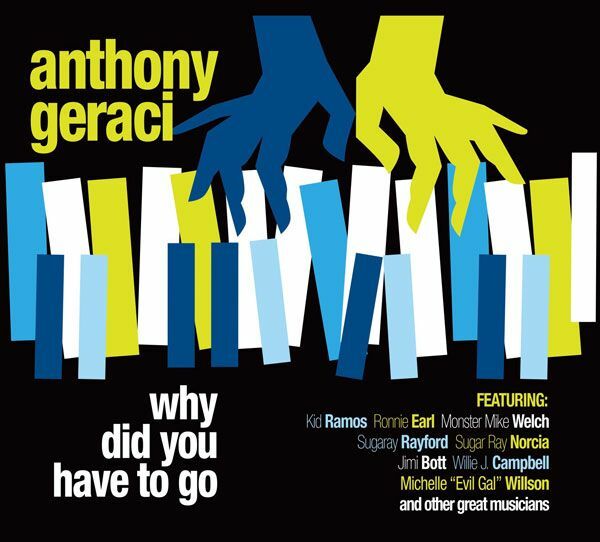 BOSTON, MA – Shining Stone Records announces the signing of multi-Blues Music Award nominee Anthony Geraci, and will release the keyboardist’s new CD, Why Did You Have to Go, on September 21. Geraci has assembled an impressive cast of musicians to perform with him on the new disc, including guitar legend Ronnie Earl, as well as many Blues Music Award nominees/winners, such as Sugar Ray Norcia, Monster Mike Welch, Michael Mudcat Ward and Neil Gouvin (all fellow members with Geraci in Sugar Ray and the Bluetones). Other guests include singers Sugaray Rayford, Michelle “Evil Gal” Willson, Willie J. Laws, Dennis Brennan and Brian Templeton; guitarists Kid Ramos and Troy Gonyea; bassist Willie J. Campbell; drummers Jimi Bott and Marty Richards; and a mighty horn section of Gordon Sax Beadle and Doug Woolverton. The CD package also features extensive liner notes by respected journalist and editor of Blues Music Magazine, Art Tipaldi. Anthony Geraci will support the new album’s release with a string of summer tour dates, many featuring his well-named tour band, The Boston Blues All-Stars, which includes Dennis Brennan – vocals/harmonica/guitar; Troy Gonyea – guitar/vocals; Michael Mudcat Ward – bass/vocals; and Jeff Armstrong – drums/vocals.